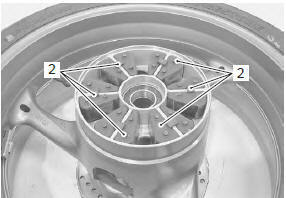 Remove the rear wheel assembly. 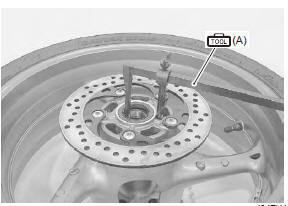 Refer to “rear wheel assembly removal and installation” . Remove the rear sprocket mounting drum assembly (1) from the rear wheel. 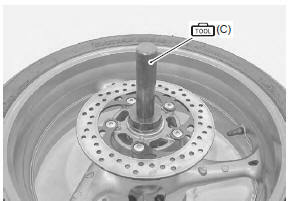 Remove the wheel dampers (2). Remove the bearings on both sides using the special tool. the removed dust seal and bearings must be replaced with new ones. 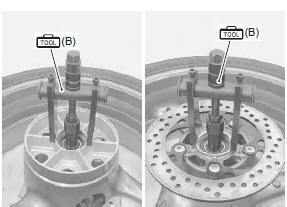 First install the right wheel bearing, then install the spacer (1) and left wheel bearing with the special tools. Install new dust seal with the special tool. 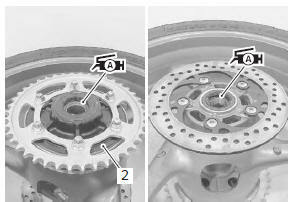 Install the rear sprocket mounting drum assembly (2). Install the rear wheel assembly. 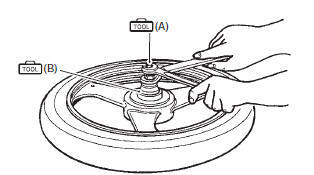 Refer to “rear wheel assembly removal and installation” .